What is Vermiculite and Why should you care? Up until 1990, most vermiculite sold in the U.S. came from a mine near Libby, Montana and contained a deposit of asbestos contaminant. That mine was closed but before it was, contaminated vermiculite insulation made its way into millions of homes and buildings. 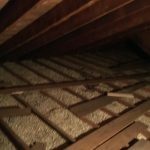 The EPA recommends that all vermiculite insulation be assumed to be contaminated with asbestos because of this widespread problem. ASSUME ASBESTOS CONTAMINATION – There is no firm cut off date for asbestos contaminated insulation; so be safe and treat all vermiculite as if it were contaminated. DO NOT DISTURB VERMICULITE – NEVER stir, handle, or move vermiculite insulation, or do anything to it that might create dust. CONTACT A PROFESSIONAL ASBESTOS REMOVAL CONTRACTOR – CALL CARDINAL ENVIRONMENTAL @ 508-635-8014 or go to the Contact Us page on this website and fill out all information applicable to your home situation. We will contact you within 2 business days. Service for the entire state of Massachusetts.